The top label lists (correctly) that songs 1, 2, 4. are published by Superhype Music and song 3. by Jewel Music. The 2nd label lists songs 1, 3, 4. as Superhype and then 3. again as Jewel… (don’t pay too much attention to the colour variance in the labels above, the 1st label is a hi-res scan from my own collection, the 2nd label is a camera photograph I’ve sourced from the internet). I’ve always had doubts concerning the order in which the various releases of this album actually appeared (1-Turqouise lettering on cover and Superhype credits on labels; 2-Orange lettering on cover and Warner credits on labels; 3-Orange lettering on cover and Superhype credits on labels). 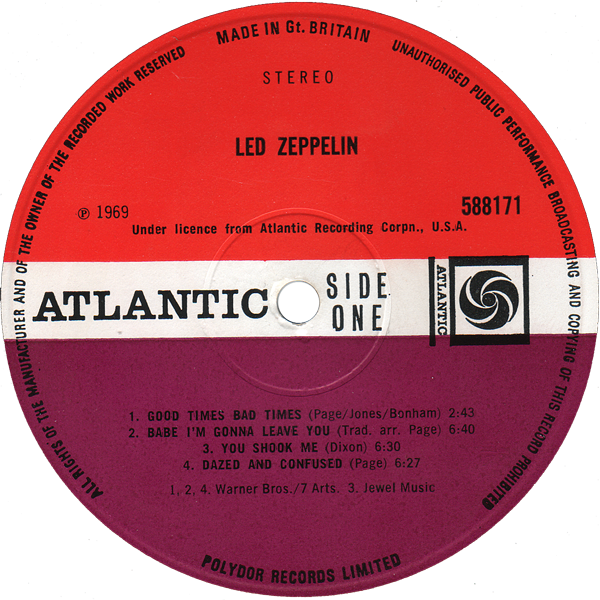 The Superhype company was created at the end of 1968 and Led Zeppelin allegedly recorded their album in September of the same year. It is much likely that they initially gave the publishing rights to an already existing company like Warner and soon switched them to the newly created Superhype. Otherwise I can’t see the point of songs credited to Superhype, then to Warner and again to Superhype in just a few months. 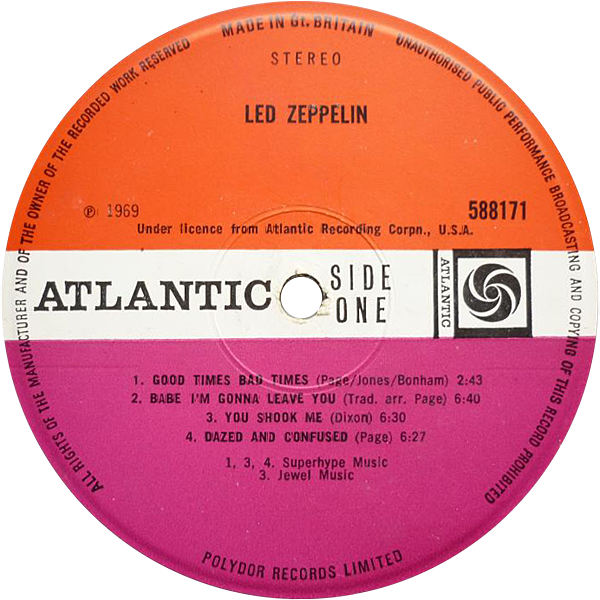 In my opinion, the original pressing of this album is the one with orange lettering on the cover and the Warner credits; the turquoise lettering cover may well have been produced by mistake or as an intended variation of the design which was not well received and soon switched back to the original colour. Hope you can give me further details. 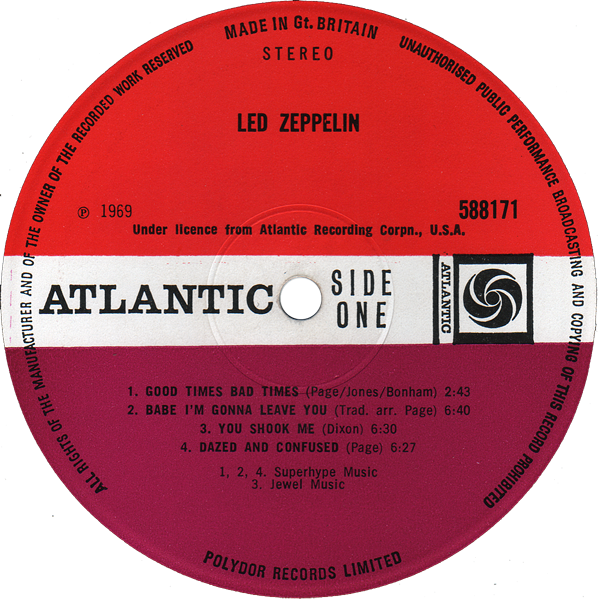 Led Zeppelin recorded their debut album during September and October 1968 at Olympic Sound Studios, London. (117 Church Road, London, SW13 9HL). Album released 12 January 1969. With regards to finding a Superhype credited vinyl in an orange lettered sleeve, I think it is more likely to have been swapped or substituted over the years…or simply that once the production run of the turquoise sleeve was halted and replaced with the familiar orange one, any existing vinyls were placed in these new orange sleeves. The Warner credit was then (for some reason) introduced for the second pressing. Ultimately…we’ll never know 100% for sure…unless we get hold of a time machine…and then can you imagine how many turquoise copies you’d try and buy in 1969 planning for 44 years into the future!!! Fast, detailed and…very convincing reply. Thanks very much Neil, I’ll keep following the nice work you’re doing! James Patrick Page is also a director of Flames Of Albion Music Limited (along with Baldwin, Plant, Hudson and one Susan Jacqueline Frankland Haile), Jimmy Page.com Ltd, Three P Films Ltd, (directors same as Superhype), Succubus Music Ltd (with Hudson and Haile), United Blag Productions Ltd (directors as Flames Of Albion), Classicberry Ltd (directors as Succubus), The Equinox Book Sellers and Publishers Ltd (with Hudson), Mythgem Ltd (directors as Superhype but also with Mrs Patricia Bonham). They were also directors of three other companies now dissolved, Cap Ten Limited, C+P Eighty Six Limited and Langwest Limited.